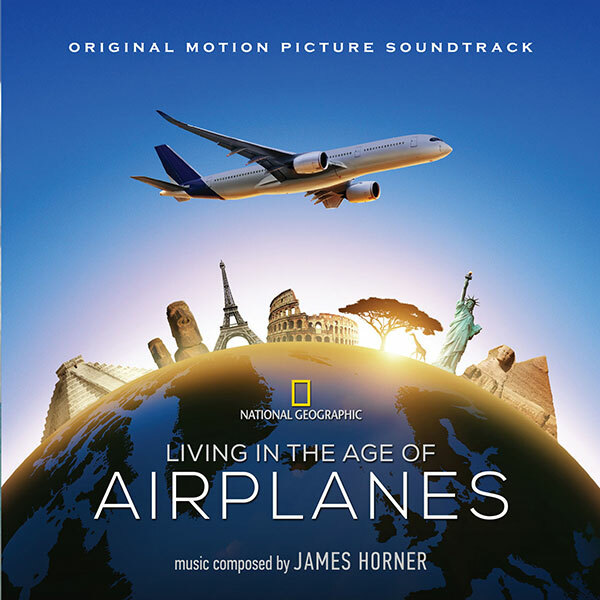 Intrada is proud to announce the premiere CD release of James Horner's score for the 2015 documentary Living in the Age of Airplanes. Horner was passionate about flying and loved to score the subject of aviation. Having previously scored the documentaries First in Flight and the Fourth Horseman, not to mention films with flying as a central theme such as The Rocketeer, Horner gravitated to the subject and poured his heart into it. One can hear Horner's very soul soaring through his music. Through a beautiful melding of wordless vocals, electronics and orchestra, Horner takes the listener on a musical journey, around the world, through time, and into the air above the clouds. Directed by Brian J. Terwilliger and narrated by Harrison Ford, Living in the Age of Airplanes takes the viewer through a spectacularly filmed journey through the evolution of transportation and the almost miraculous way the barriers to traveling far and wide fell away with the advent of the airplane. Through striking visuals, the film shows how relatively stagnant and primitive humankind's ability to move around was for most of human evolution, only fairly recently allowing travelers to get to islands with no way in except by airplane, allowing flowers to travel from Kenya to Amsterdam to Alaska in just days, or just getting from one coast to another in mere hours. Without the airplane, people would probably not make these journeys. Now come take flight with James Horner's magical score, his music lighting up the runway from the past to today, and soaring with the human ingenuity that opened up the world to all of us.